The Japanese American National Museum uses objects to interpret Japanese American experiences in meaningful and memorable ways for its visitors. The two sets of objects here, from the permanent collection of the Japanese American National Museum, illustrate some of the issues related to interpretation. As you examine these objects, consider how the same object can have different meanings for different people, or how their meanings are specific to their contexts of use and display. Objects are touchstones for emotions, experiences, and events that embody both personal and collective stories. They stand as tangible evidence of historic moments. They symbolize social relationships. Yet they are literally mute. They gain voice only through the collection and interpretation of their specific stories, context, uses, and significances. In a little over a century of Nikkei history, objects have already proven important in capturing the past. Unfortunately, objects are prone to being damaged or lost. As a member of a community, an organization, or a family, you can help capture the legacy of your forebears by preserving objects and giving voice to them. Here we explore the example of the Japanese American National Museum and Japanese American history, but many of these concepts, approaches, and methods are readily applicable to other individuals or community groups. The flag is a general and familiar symbol of the United States, patriotism, and national affinity. The Japanese Americans who owned these flags endowed them with their particular values and emotions. Although on one level they are similar -- they are all made of fiber and figuratively represent the flag -- they were created or used in specific historical contexts and periods so that their ultimate meaning is quite distinct and varied. This flag was created in 1938 by the Japanese American Citizens League chapter in Monterey, California, for a Fourth of July Parade. 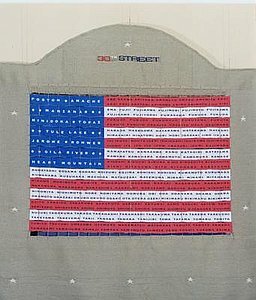 Measuring 40 by 70 feet and requiring 50 people to support it when unfolded, this flag has been paraded throughout California as well as in other states. It is interesting to note that at the time of its creation, Japanese immigrants were considered "aliens ineligible for citizenship," which suggests different and layered interpretations. During World War II, when Japanese Americans on the West Coast of the United States were incarcerated for the duration of the war, the flag was displayed in Utah, a region not subject to mass incarceration. In 1946, the flag was used to welcome home returning Nisei soldiers in Idaho Falls, Idaho. 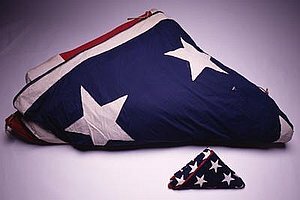 This flag was presented to Kin Tanahashi, the mother of Second Lieutenant Kei Tanahashi, when his remains were returned to Los Angeles in the late 1940s. Kei, born and raised in Los Angeles, California, was incarcerated at Heart Mountain concentration camp in Wyoming during World War II. He was inducted into the army in 1943, and he served in the 442nd Regimental Combat Team, Company G. Wounded in action on July 4, 1944, in Castellina, Italy, he died after insisting the medics treat other injured soldiers before him. 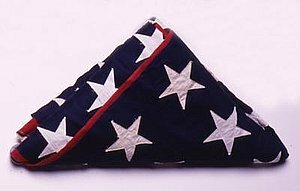 In this case, the flag represents the death of a soldier, and according to military protocol, should remain folded, rather than unfurled and hung. Momo Nagano (b. 1925) is a Nisei artist and teacher who grew up in a Los Angeles neighborhood referred to as 30th Street. She created this weaving to bear testimony to those denied their constitutional rights as American citizens when they were forcibly removed from the neighborhood during World War II. While the project memorializes specific families, it is dedicated to all of the communities within the Western Defense Command that were similarly dislocated as a consequence of wartime hysteria and racism. Photographs can function as portraiture, documentation, a means of communication and exchange, or as works of artistic intent. They are both an index of what was photographed and a medium of interpretation. The methods of their presentation also differ. They can appear in frames, albums, or publications. Likewise, their forms can vary. They can be black and white or color, glossy or matte, on paper or another surface. The varying formats suggest different usages, meanings, and intentions; for instance, a personal keepsake, a work of art, or documentation of an event. These two photographs are from the personal collection of Melba Yonemura, the daughter of an Issei man and German-American woman. 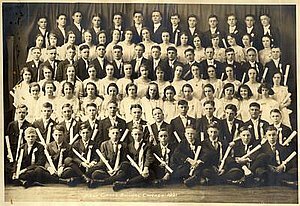 The 1921 class picture from Holy Cross Junior High was taken shortly before Melba and her family moved from Chicago to California. Five years latter, the Jefferson High School class panorama shows the diversity of her public school in Los Angeles in contrast to her parochial school in Chicago. These photographs have a different, personal meaning to Melba's son, Walter, than they might for a researcher assessing diversity among pre-World War II Japanese Americans. This "test shot" of Melba Yonemura was arranged by her mother Camille in the late 1920s. After finding work at MGM Studios, Camille attempted to fashion her daughter as a movie star -- an "Oriental" Clara Bow. Camille rechristened her daughter "Melba Dupre" and presented her daughter as her sister, in order to conceal her own age and the fact that she had been married to an Asian. While the photograph is a portrait, it is also a fabrication of a character, one with a different name and history than the woman depicted. Issei photographer Taizo Kato operated a photography, art, and stationery store in Los Angeles' Little Tokyo. 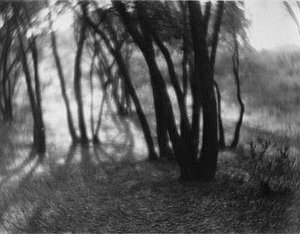 This 1920s print is in the style of Pictorialism, a late-nineteenth century art photography style often characterized by a soft-focus and dramatic contrast of light and dark that emphasizes mood and atmosphere. It is likely that the photograph was taken in a nearby park, but through his artistry, Kato makes it seem far from urban Los Angeles. In this case, intent is a critical factor. 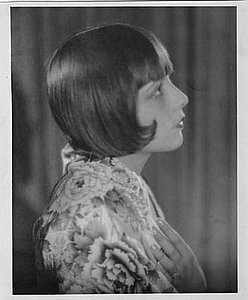 The artist was working in the context of art photography of the day and his work was both recognized and published by American photographic journals of the 1920s. In another context, one might say that this work was out of focus.